Not sure why Wowhead is showing him in Blood Watch. He is in the Exodar at 32, 54 (up the stairs). He also appears at blood watch for the celebration at the end of the nether coil quest chain, in which you recieve the tabard of the hand. If you didn't talk to him at blood watch for the tabard quest you can talk to him at the Exodar also. He will give you the reward there too. I spoke to this npc at the Exodar and he didn't give me anything. 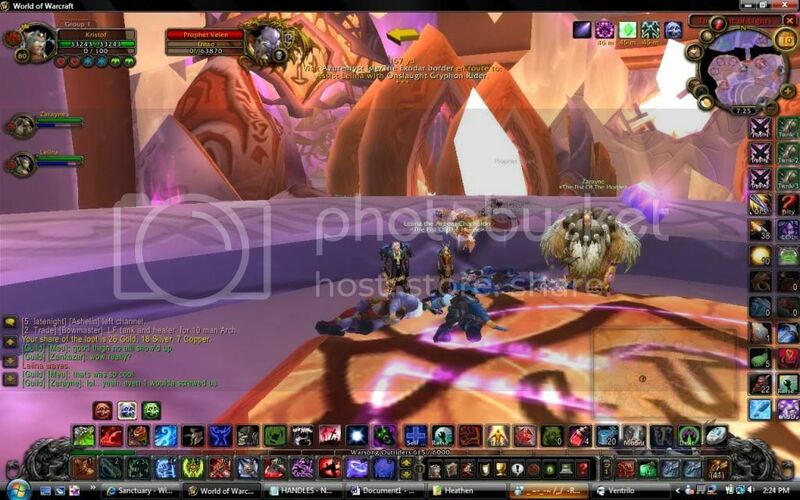 Savage Defenders on Eitrigg celebrated their 1 year birthday by taking 40 of our finest and downing this clown (right after Tyrande Whisperwind) on 3/23/07. The fight was tough, I'll admit and took several tries to nail it. The guy fights like a Paladin and does an AoE smite kind of attack that can seriously hurt the raid if they're not at max range. But beyond him, you have to worry about all of the fast-respawning adds around him. Fortunately, they're non-elites and can be AoE'd down easy. The biggest obstacle was placement for the boss and DPS watching their AoE attacks in his direction; Multishot pulled a Battlemaster into the mix several times, but if you avoid directly attacking them, they will not aggro. lol 40 man on him xD. we did like 9 guildies and ~30 randoms on him. he spams some kind of smite spell and has lots of adds. get warlocks on adds and DPS him liek crazy. I'm sorry, but 40 man? "The fight was tough"? Velen is a pushover. Almost no alliance ever go to Exodar, if it was as crowded as Stormwind or Ironforge, I could see you needing a full group, but if you can find him, you can kill him. 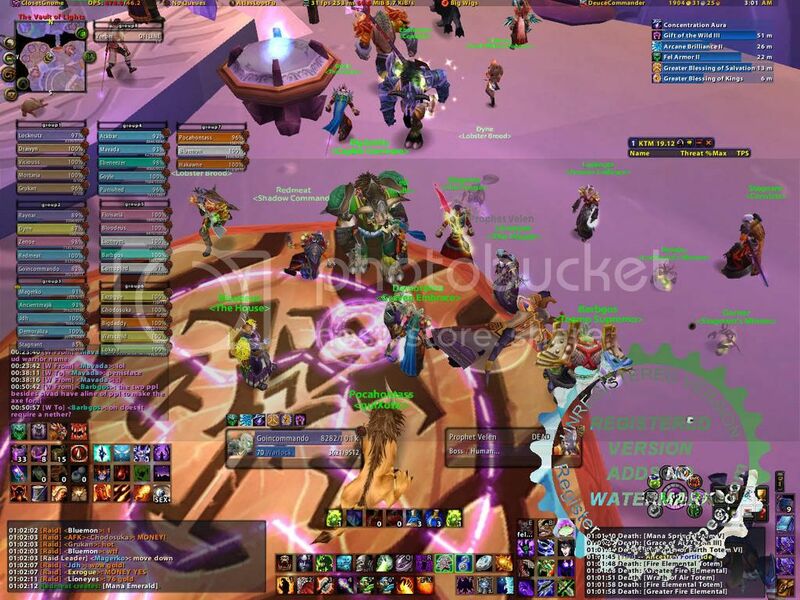 12 man Exodar raid. Its not a full video, but it has the kill shot and that all the proof you really need. Took us about 10 minutes. I'm not even sure if we had Prince Malchezaar killed when we made that video. To anyone who wants to kill him, just do it, you'll have no trouble. Our tree recorder knows Velen is male, the whole "Queen of the Exodar" thing is just his bizarre sence of humor. We nicknamed the only ally who tried to stop us "Huntard"
I'm the one on the green hawkstrider at the beginning. Theres a nice shot of me dancing on Huntard at the end ^_^. I apologize for the lack of music, we didn't consider the video worth completing. The video is a month and a half old (approx). The Prophet Velen is the oldest of all the Dreanei. He, Archimonde and Kil'Jaeden got an offer from Sargeras. He offered them eternal power and might. Archimonde and Kil'Jaeden quickly aggreed, but Velen had his mistrust. He had a vision showing his two friends, and his people, serving Sargeras as demons! Velen asked the Naaru for help, and the Naaru O'dor told him to go to the highest mountain, on the day where night and day were 12 hours. And so he did... And with him, he brought the people who believed him. He took forth the Naaru crystal, and a spaceship landed in front of them... They got on it... Just in time... But the fight was not yet won. Kil'Jaeden followed the Dreanei (Meaning the exiled ones) for a long time. But finally they found a place where they stayed for 200 years. ( Living along side the orcs ). 20 manned him yesterday (25/08/2007), horde pug in Shadow Moon server (US). 5- From time to time, He will kick the main tank and start attackingthe second on the aggro list, that's why you need 2 tanks. I hope you enjoy the fight, it took us 3 attempts, because we were not expecting adds on the first time, and on the second time, we only had 12 players and we were not that organized. This guy looks like a badass. I want his armor, to date it's artwork isn't on any player equippable items. killing one leader should be worth like a whole field marshal set. after entering the vault of lights, gather up in the middle, go slowly to upstairs by killing shield of valens. when you enter his circle, melee can stay in the middle and dps can spread out a little bit (not too much, just around the circle). be sure that healers heal the aoe classes during the add waves, and every single dps should go for shield of valens and peacekeepers when they come to you. forget about the threat and throttle the dps, he doesnt hit hard just like its said above. twas fun :) its awesome to get hk: leader. any chance his greeting "Not all who wander are lost." is a reference to the song by Devildriver , Not all who wonder are lost? Last time raid attaked to him he just stand on his place like evading. he lost hp but suddendly 20guards came from no whre. and every 5sec new one respawned. 5min he bugged and then we had every NPC against us in exodar. and when we killed 1 another came. Bug? Magtheridon Server, horde 10 manned this guy. I was there to watch from my dead body as I got 2 shotted by a Hunter that crit me for over 5000. Something was definitly up with that stuff, i Armory'd them all and saw that they were wearing Greens. I didn't believe that for a second. Alliance bosses are a lot easier to face than the horde ones.. plain and simple, and it's a proven fact. He is just an ?? boss in Exodar and what so?,What do he speciel expect that he was once one of the three leaders of Argus but that do we not talk about now... Say me what do him so SPECIAL??? He quotes J. R. R. Tolken, if you click on him. He sometimes says "Not all who wander are lost". EDIT: Thank you Antubis for the correction. Did this today with 7 people. If you dont have 2 tanks, it is possible to have a ranged class second on aggro. This way he wont oneshot melee when he deaggro the MT, he will rather turn around and start smiting the ranged 2nd on aggro. I'm also wondering this myself. I have the quest which summons him completed and ready to hand-in on my Alliance Alt, and was thus thinking of calling in some horde guildies to kill him once he has been summoned. I think its funny that in wow model viewer he has around 4 different sitting animations, despite the fact that I have never seen him sit down. i dont get it, he has 2,200 health , i never raided this guy before but that sure does seem like very little health for a 10-40 man raid. is he like the priest in stormwind that bubbles through out the whole fight ? HEALTH: I would estimate that he has roughly 2,000,000. MELEE: He hits Plate for 500 - 1,000 damage. SMITE: This spell is constantly spammed at targets which appear to be randomly chosen. It hits for 1,000 - 2,000 damage. The damage, though small, adds up quite quickly. BLAST WAVE: Every 20 - 30 seconds, Velen casts this spell which deals 4,000 - 6,000 damage. Healers and ranged attackers should stay at maximum range to avoid it. Once Prophet Velen is aggroed, several Shield of Velens and Exodar Peacekeepers will spawn and aid him. Prophet Velen is surrounded by Battlemasters. As such, there is a very high chance that they will aggro and attempt to destroy the Horde. Out of all of them, the only Battlemaster worth mentioning is Mitia, the Eye of the Storm Battlemaster. She hits very, very hard and has a fairly large amount of health. She should be killed before pulling Velen is pulled to avoid unnecessary deaths. Prophet Velen can be defeated somewhat easily with a good 10-man group. Since the Exodar is frequently abandoned, there should be little worry of interference from the Alliance. That fella was downed last night on Shattered Halls(EU) with 40 chaps. Downed him on the first time and after a long (and boring) fight. You kinda need to overOVERcap your hit ratings to get him.. We ended up with our best dps, a hunter, tanking him, once he took Velen over from me, a holy priest. He is pretty much the easiest of the four, getting rid of the guards before taking Velan is pretty much compulsory. Actually he doesnt need a good tank to down him. Whoever has over 5k hp can manage tanking him, as his holy shock still does about 2k dmg..
Downed with pug raid 10.17.08 around 2-3 AM. He had 5,500,000 health, spammed Smite. Downed 19/10/08 on Stormscale EU by a 40 man raid. REALLY easy boss. No one hangs out in Exodar, so you don't really have any problems with the Alliance. Run up the stairs as one big group and take out all the guards. Pull Velen and basically just tank and spank. He only uses a Holy Smite which does around 2k damage, so anyone can tank him, as long as they're being sufficiently healed. Took us maybe 10-15 mins of just dps to get him down. Downed with raid 40 man 10.25.08 around 6 AM. Downed him with a pug group on Dragonblight EU, two hours ago. Although he's a level 80 boss mob now (which makes him normally 83), his attacks are still weak. The only problem with him right now, is because he is 13 levels ahead of you, most of your attacks and spells will miss against him and it will take more than 20 minutes to down him with a 30 man group. He has around 5.7 million HP as a level 83 boss. He rarely uses his melee, but used on me when I overaggroed the tank, he hit with a crushing blow of 12k. I guess his melee attack has been buffed but his Smite is still very weak and deals no more than 2.5k on a level 70 player. His main problem is the adds he summon, because the guards are now 75 and Shields of Velen are now 83 elites, but he still is the easiest of the Alliance bosses. nice tip from Turtlemilk about the BattleMasters but if you are going to raid this guy today.....be sure to take out SOTA ( Strand of the Ancients ) battlemasters before you pull Velen, the battlemaster does a Whirlwind on leather for 5,5k and mortal strikes... can almost 1shot a cloth wearer. Today you dont have to worry about EOTS BM only 352k health and are " grey " and easy to take out. Cake at level 80. 6-manned him 'cause we couldn't find enough flagged players in Exodar for Wrath of the Horde and we got bored. Figured we'd wipe, tried it anyway. Ferlol tank (cat spec, bear form), disc priest, arcane mage, 2 x BM hunter, shadow priest. - Don't have a healer who will go out of mana; do have at least one innervate. - Alliance players might show up. Kill them for the Wrath of the Horde achievement. My first time playing a Draenei character on Blackwater Raiders (US) server, I saw a horde raid of about 20 or 30 people (could have been more, I didn't bother to count them) attempt to kill this guy. They failed horribly. I didn't think to check the prophet's hp right before the last guy wiped because I was still new to WoW. I thought it was hilarious that they failed so horribly when there was almost no alliance player presence in the city at that time. I don't recall exactly when this was, but I know it was sometime in september of 2008. You know a Draenei's old when his beard's longer than his face-tentacles. How old is this guy again? This poor guy has to stand all the time, except Tuesdays, then hes somewhere...hiding from Saurfang. 1) Take a boat from Darkshore to Azuremyst. 2) Go a bit northwest from the docks and there's a back entrance to the Exodar. 3) The shortcut will take you almost right to him. He's a short walk away. 4) Wipe out the guards and start on Velen. He uses only holy attacks, and if caster DPSers stay a good bit away they won't take a hit. There are rarely any Alliance players in the Exodar, so you should only have a problem with this guy if there are any. Putting Out the Light, easy mode. anyone know the respawn timer on this guy? Actually he's 3 manable (1 DK tank, 1 Holy Priest, 1 Boomkin). Fist of the Horde did it on Kirin Tor at 7:25AM 10 Apr 09 server time. For tactics we kept it simple. I tanked hm on the platform with my back to the wall so that I would not get thrown. AOE pulled all adds to me as they spawned and Boomkin burned them down. Whenever he kicked me, I would just taunt him again to pull him off the Boomkin. The only issue was Boomkin going OOM because the battle went so long. Healer was able to keep the tank up easilly and still wand the boss most of the time. Note, this probably would have been completely impossible if we'd been attacked by allies. But as far as the NPC and his guards go its doable with a single group (obviously). This was not a planned event. We just got bored and decided to attack Exodar... no one stopped us so we killed Velen. Epic boredom... lawlz. Hehe, this guy spawns in Bloodmyst when you hand in the final step in the dreanei starting quest chain (Along with loads of other NPCs). Awfully funny to watch him WTFPWN some unsuspecting e-peen stroking lv 58 DK who likes killing quest npcs, by handing it in while the DK is running up to the building. Wish I could see the look on his face when he gets 1-shotted. I love this guy! Hes a cool priest! If you down him, it does not mean you kill him. Me (A priest, i was disc) and a rogue two manned Prophet Velen. No alliance came to attack us for the entire fight, took about 41 minutes only because the rogue died, easy for me to stay up long enough for the rogue to come back. Hits me with Holy Smite for about 4k so I tanked it as the rogue kept on using Tricks of the trade and vanishing, killed guards when needed, never went below 50% mana. He melee hits for 11k so make sure he's attacking a ranged target. We were both in tier 7.5 gear. We did this because we were trying to get the Wrath of the Horde achievement, and no alliance were there. Gave us each 843 Honor and dropped about 78 gold. Ah, beating up an old man, nothing quite as satisfying as that. In a old sci fi television show called Babylon 5 there was an alien race called the Membari. The spiritual leader of the Membari was the Prophet Velen. The "clown" sure did you freaks a big favor. What set is he wearing? Why cant the draenei men have models like him? seriously i compare mine to him and it makes me feel fat, he grew tall. my shaman grew... out >.>;..
"As we attempt to gain the help of the peoples of this world against the Burning Legion, we must also learn to live peaceably amongst them. Please keep this in mind as your journey takes you throughout Azeroth. May the Light guide you." One of his quotes are "I foresaw this" or something along that when you aggro him. If he foresaw himself getting 3manned why in the hell was there no security? His weapon has changed with Cataclysm. He is now wielding Exodar Life Staff. Convenient, I think! "Empowered by the holy light and the undying strength of their convictions, the Draenei led the charge against the Demonic Burning Legion in Outland. Now with the legion's defeat, they have completed the desperate mission that first brought them to Azeroth, through some Draenei were sent back to Outland to revitalize their former civilization, the majority have vouched to remain and uphold their sacred commitment to the Alliance. Driven by a powerful vision, the immortal prophet Velen believes that a great war between the darkness and the light is fast approaching and that Azeroth will be its principle battleground. As one of Velen's chosen you must stand bravely before the shadow and ensure that your people are ready for the war to come." I guess we can put to bed whether this guy is immortal or not, but are all draenei the same? The logical answer would be yes. But by crazy wow rules who knows. You can find him in Stormwind, having a conversation with the other alliance leaders about the earthquakes. He has very skinny legs. Walking at the very front of the little group was Prophet Velen himself. He was unmistakable; his simple tan robes contrasted with those of his entourage, and of course his strange white skin was unique. Prophet Velen is definitely one of my favorite WoW characters of all time. I think on wowwiki it states that Velen is immortal, along with Jessera-both are around 25k and up in their years of living. Velen, being a prophet, has been foretelling a great conflict between the forces of the light and the forces of dark. The forces of dark could either be the Burning Legion or the Old Gods, but then again, perhaps there is a connection between the two that will cause them to join forces. The forces of light are probably the combined forces of the Horde and Alliance, seeing as neither is supposed to be completely evil and both sides are sworn enemies of the aformentioned forces of darkness. Spoilers for the novel Wolfheart.Velen also has mentioned that Anduin Wrynn has a promising future in the Light, which may lead to him teaching Anduin the ways of the priest. FINALLY AT LEAST SOMETHING! at least blood elves got bread crumbs then getting nothing. "Stay a while and listen!" Dunno if this is a noob question because no-one has asked it, but why does he have crystals for eyes? Velen: the guy on the OH CRAP end of the most horrific breakup fallout ever to exist. Kil'Jaeden is really the cosmos's nastiest stalker ex. you can see up his dress ! Even being in his presence feels good. Even being in his presence is something. During the starting demo area for the Alliance in the Shadowmoon Valley, you work with Prophet Velen to fight off the Iron Horde in the new expansion of Warlords of Draenor. If you want a little spoiler on what happens, hover below. Warning, it is a spoiler. Thank you. Alliance players fight Ner'zhul at the end of Shadowmoon Valley questing. He turns a Naaru into a "Dark Naaru" and to purify them, Velen sacrifices himself and dies. What follows is a large battle between the Draenei and Iron Horde, whom you soundly beat. I solo'd him today as a 572 protection warrior. took about 2 hours. And I'm going to say this again in a proper comment so it's seen. This Velen isn't the Velen who dies in Shadowmoon Valley. The Velen in the Exodar is Velen-Prime, he's from the main universe (or Prime universe in current DC-style naming convention), while the Velen, and indeed the entirety of Draenor, featured in Warlords of Draenor is an alternate universe (following DC-style naming convention this would probably be Draenor-2). Blizzard's marketing dropped the ball on this and didn't make it clear enough that this is an AU-story, not a time travel story. "An invasion from an alternate reality and a parallel universe me is there and he can do crazy priest magic !@#$? I have more important stuff to attend to. Such as finishing a tabard quest. That or he has a horrible case of Altzheimers. This NPC can be found in The Exodar (4) and Bloodmyst Isle. Velen was one of the three leaders of the eredar who lived on Argus many millennia ago. When the dark titan Sargeras discovered the eredar, he offered them untold power in exchange for their service. The two other leaders, Archimonde and Kil'jaeden, gladly accepted the offer, along with two thirds of the eredar race. Velen however had the gift of sight, and was warned by the naaru K'ure of Sargeras' ulterior motives. Sargeras was planning on turning the eredar into evil beings to champion his Burning Crusade against all light in the universe. Velen and his followers narrowly managed to escape Argus, closely pursued by the newly created Burning Legion. Once his best friend, Kil'jaeden had sworn the destruction of Velen no matter the cost. For thousands of years, the exiles, or "draenei" as they now called themselves, fled Sargeras armies. They eventually settled on the world of Draenor. On Draenor, they found the tribal orcs, and began trading with them. The draenei established Shattrath as their capital, and Velen set up his own refuge at the Temple of Karabor, on the eastern edge of the lands of the Shadowmoon Clan. This peace, however, was short-lived. Kil'jaeden's minions discovered Draenor, and informed their master of the draenei's whereabouts as well as the existence of the orcs. Kil'jaeden recognized the orcs as a tool for vengeance, and contacted the elder shaman Ner'zhul, suggesting the draenei were plotting against the orcs. In short time, the orcs began to distrust the draenei, and soon began to attack them. Under Kil'jaeden's manipulation, the orcs became increasingly violent and bloodthirsty, and soon began to wield shadow magic against the draenei. The shaman Gul'dan became Kil'jaeden's prime pupil, and as one of the first warlocks led the orcish horde against the draenei. Shattrath city was destroyed, and Velen along with the surviving draenei went into hiding. Velen's temple was seized by Gul'dan and turned into the Black Temple. Over the following years, the Dark Portal was opened, the Orcs invaded Azeroth, and Draenor was eventually torn asunder, henceforth to be known as Outland. Still many years later, Outland was visited by Illidan Stormrage and his companions, Kael'thas Sunstrider and Lady Vashj. As Kael'thas took up residence in the naaru fortress of Tempest Keep, Velen decided it was time for his people to find a safer home, and personally led a raid against the blood elves to capture the Exodar, a satellite structure of Tempest Keep. The draenei succeeded in capturing the Exodar, but the Blood Elves managed to sabotage the ship, causing the draenei to crash land in Azeroth, on the Azuremyst Isles. After the dust settled, the surviving draenei once again began building a new home. Word of a heroic Alliance of Light-wielding races had reached the Prophet and his people, and they set out to discover their potential new allies in their continued resistance to the Burning Crusade.